Uninstall any old version of PocketClive before installing this new version (your snapshots should be safe). Choose either instruction depending on if you downloaded the installation program or the CAB file. Also note that you have to install GAPI from Microsoft on your PocketPC, see below. Just run the installation program on your desktop computer (making sure that you have contact with your PocketPC) and follow the instructions. Download the file using ActiveSync to your PocketPC and execute it. This section describes both how to download games to your PocketPC and how to install GAPI (the Microsoft Game API library). 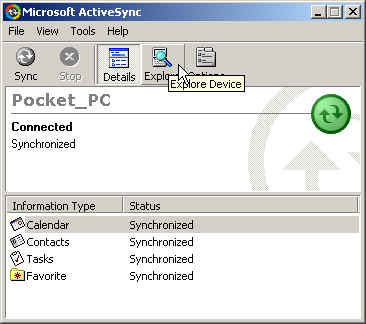 To download games from your desktop PC to the PocketPC you must have Microsoft ActiveSync up and running (see the documentation that came with your PocketPC for troubleshooting the connection). Open up the ActiveSync window (see picture below) and press Explore. This will bring a window showing the context of your PocketPC (see picture below). 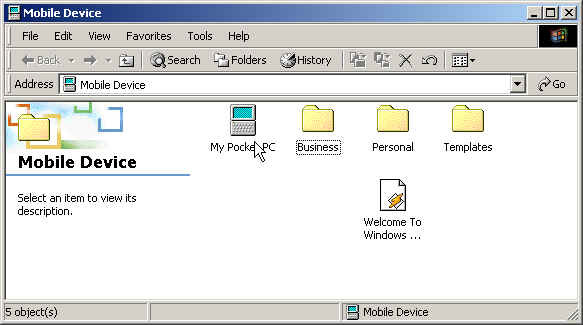 Note that your are always directed to the \My Documents directory of the PocketPC and you have to double-click the My Pocket PC icon to get to the root of the file system on your PocketPC. All snapshots (.sna and .z80) must be installed in a directory called Roms which resides in the same location as the PocketClive.exe executable (this is \Program Files\PocketClive if you have an english PocketPC and you installed PocketClive to the default directory). Navigate to that directory (see picture below) and you can now use ordinary drag-and-drop from an ordinary explorer window to this Roms window. In exactly the same way all tape files (.tap and .tzx) has to be installed to a directory called Tapes. The Microsoft Game API library must be installed on your PocketPC. 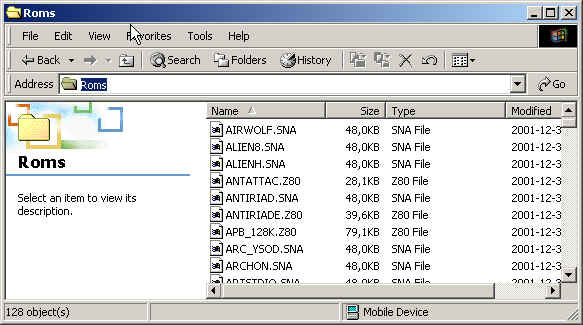 This library can be downloaded from free of charge from the Microsoft page http://www.pocketpc.com (see the developer section). The GAPI zip files contains versions of a file called gx.dll for different processors (e.g. if you have an iPAQ you want the ARM version). This file must be downloaded to the PocketPC directory \Windows, using the exact same procedure as when downloading a snapshot or tape file.